The European Commission yesterday cut its forecasts for the Eurozone’s economic growth this year, citing trade tensions with the United States and rising oil prices, which push the bloc’s inflation higher, among the top causes for its revision. The slowdown of the Eurozone economy is set to affect all major economies of the bloc, but is expected to hit Italy harder, as the country will record the lowest growth rate in Europe, matched only by Britain among all 28 EU countries. 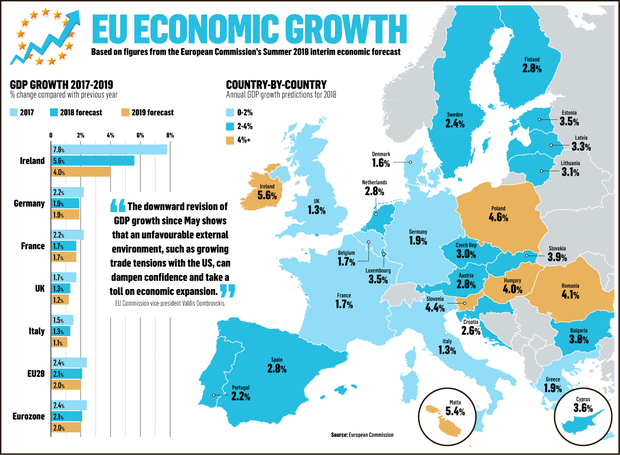 The EU executive estimated the 19-country Eurozone will grow by 2.1pc this year, lower than the 2.3pc gross domestic product (GDP) increase it had forecast in its previous estimates released in May, and further below the 2.4pc growth recorded last year. In 2019, the bloc’s growth should further slow to 2pc, unchanged from the previous forecast. “The downward revision of GDP growth since May shows that an unfavourable external environment, such as growing trade tensions with the US, can dampen confidence and take a toll on economic expansion,” EU Commission vice-president Valdis Dombrovskis said. Rising oil prices have also contributed to the slowdown, the commission said, and are expected to push Eurozone’s inflation up to 1.7pc this year and next, from the previously estimated 1.5pc in 2018 and 1.6pc in 2019. Germany and France, the two largest economies of the Eurozone, are expected to lose steam this year and next. Germany’s GDP expansion will slow to 1.9pc this year and in 2019 from the previously estimated 2.3pc in 2018 and 2.1pc in 2019. It grew 2.2pc last year. France’s economy will grow 1.7pc this year and next, much below the 2.2pc growth it experienced last year. The new estimates are also less optimistic than the 2pc growth the commission had earlier forecast for this year and also slower than the 1.8pc growth previously forecast for 2019. The slowest-growing economy of the bloc will remain Italy which is expected to grow only 1.3pc this year, less than the 1.5pc estimated in May. The Italian economy will further slow to 1.1pc in 2019, farther down from the 1.5pc growth recorded last year, according to the forecast. One of the causes cited by the commission for the revision were “re-emerging concerns or uncertainty about economic policies”, as Italy’s new eurosceptic government has launched ambiguous messages on its future spending plans. Only Britain is expected to match Italy’s sluggish growth among all the 28 states of the European Union. It will grow 1.3pc this year, according to the commission, less than the previously estimated 1.5pc expansion – a big drop from the 1.7pc GDP rise recorded last year. In 2019, when Britain is expected to quit the European Union, its economic expansion should slow further to 1.2pc, the commission predicted. It stressed however next year’s forecast was based on technical assumptions as the unclear outcome of Brexit talks could have unpredictable effects on the country’s economy.